My daughter loves LEGO and loves Star Wars, so naturally she enjoys playing with LEGO Star Wars. This week we were lucky to be sent a trio of sets to build, play, and review. When they arrived my daughter was rather overcome with excitement. A special delivery has this Star Wars fangirl LEGO EXCITED! But where to begin? (The t-shirt is pure coincidence btw). Honestly, her choice of a LEGO Star Wars t-shirt that morning really was a coincidence. I assumed she’d have trouble deciding which one to make first, but she opted straight away for the set with Darth Vader. She loves Darth Vader. I like to think it’s because he’s Leia and Luke’s daddy. This new Star Wars LEGO set recreates the iconic setting of the final showdown between Luke Skywalker and Darth Vader in Return of the Jedi in the Emperor’s Death Star throne room. My daughter and I spent an afternoon making this together, while listening to the Return of the Jedi soundtrack (her idea). Given this set is recommended for 8+ and my daughter is a 3-year-old, I was the Master Builder with my daughter assisting. Playing LEGO is a great joint activity for us, and while she can’t make a set like this herself, it helps her develop her fine motor skills, ability to follow instructions, general concentration, as well as her imagination, when we build LEGO together like this. 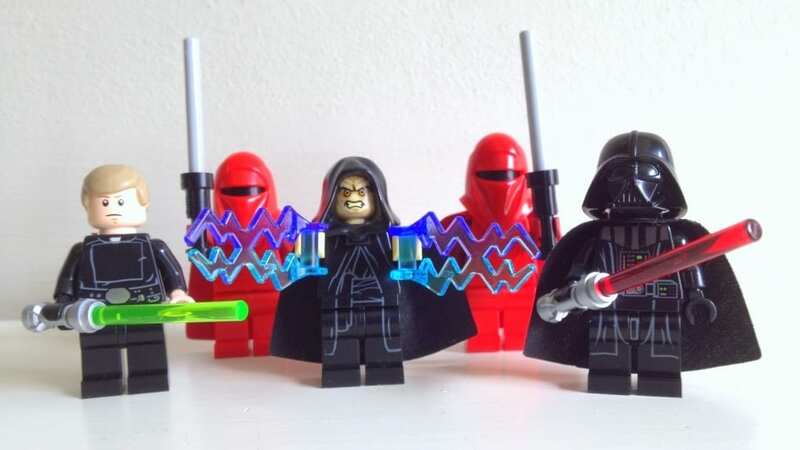 She did have sole responsibility for the minifigs though, of which there are five – Luke Skywalker, Darth Vader, Emperor Palpatine, and two of his Royal Guards. And the Darth Vader figure is particularly nicely detailed, with a two piece helmet so you can recreate the big reveal. As well as the adapted setting, this also has interactive elements such as a collapsing walkway and stairs, sliding doors, plus a minifig ‘force jump’ lever, and even mechanism to fire a lightsaber in the air. There are also hinges and siding parts so it can be opened up or closed between play sessions. I actually have an early precursor to this set. That one wasn’t very impressive. To call this new set an improvement is clearly an understatement. The fundamentally great thing about this is that it’s a playset. It provides my daughter with a detailed LEGO Star Wars environment for her to recreate scenarios with her minifigs. We have a bunch of LEGO Star Wars vehicles, which are great, but this is our first playset (the one above clearly doesn’t count) and the way she interacts with it is a joy to behold. My daughter loves to improve upon the existing stories, usually by adding more female characters (for instance, she made her own Princess Leia minifig and a brand new scenario to go with it). As this scene is all male, she addressed the lack of women by bringing in a couple of female characters from the other sets we received. Today will be a day long remembered – we finally have a LEGO Princess Leia, PLUS Sabine from #StarWarsRebels too! Eventually, we came up with our own alternative finale. Our rewritten Return of the Jedi ending: Luke and Darth Vader are about to begin their lightsaber showdown. On Endor, Princess Leia has reflected on the bombshell that Darth Vader is her father, and realises that the Force is strong in her too. She finds a spare lightsaber of Luke’s and flies off to resolve the conflict the impending conflict between father and son. She brings along legendary Rebel fighter Sabine Wren for back up. Leia’s confidence and diplomatic skills diffuse the situation before any fighting can begin (leaving Luke and Vader a little perplexed). The Emperor is arrested for his crimes against the galaxy, led away in handcuffs, and they all leave before Lando destroys the Death Star. The End. And that was rounded off with an epilogue that my daughter created all by herself. My daughter's Return of the Jedi epilogue: Luke and Leia thought Darth Vader needed a glass of wine. Sabine felt she deserved one too, so had one while relaxing on the Emperor's throne. Fini. This is a perfect LEGO Star Wars set to enable any little girl (or boy) to create new adventures with. While it was satisfying to construct, it’s far more fun to play with. My daughter usually tries to pull apart any sets we build, but she hasn’t even attempted to with this. She far too busy coming up with more stories in the galaxy far, far away. The force is strong with this one. The LEGO Star Wars – Death Star Final Duel set (75093) has an RRP of £69.99, and is available to buy here. Disclaimer: While I was not paid to write this review, we did receive this LEGO set free of charge. All opinions stated remain our own. If you’re a Star Wars fan who’s always wanted to know what it would feel like to sit next to Chewbacca in the Millennium Falcon, or opposite Han Solo in a Mos Eisley Cantina, then the new Star Wars at Madame Tussauds attraction sounds perfect for you. My wife and I took our little Star Wars fangirl along to it this week. With 16 different characters placed in a variety of iconic scenes from the movies, this latest addition to the famed London attraction offers Star Wars geeks plenty of opportunities to post selfies from the galaxy far, far away. First up we sat down next to Chewie in the cockpit of the fastest hunk of junk in the galaxy. As with the whole attraction, the attention to detail was great, and Chewie looked terrific. …this big red button next to you. Hit it and you launch into lightspeed! Chewie’s Corellian co-pilot was stuck in Mos Eisley, so my wife and daughter sat down next to keep him company – then an uninvited guest joined them. Our droids? They had to wait outside. These are definitely the droids we’re looking for. I was also really happy to see these guys. Generally, the models were great and the environments they were set in have been nicely realised. I personally felt that the non-human characters worked best as they look just like you imagine the ‘real’ ones would, and this is the most immersive aspect of the attraction. The others that are based on actors, while they’ve been finely realised, are more similar to the traditional Madame Tussauds figures. Still great for taking photos with though. The choices of characters and scenarios is mostly satisfying for any Star Wars fan. However…. I was disappointed that there was no place for Padmé Amidala, and especially sad that the chosen setting for their Princess Leia figure was with Jabba wearing her ‘Slave’ outfit. Princess Leia is a badass, but this is the character’s lowest, most powerless period in the whole trilogy and it’s a shame it’s become the default Leia image to many. Overall though, I feel that Star Wars at Madame Tussauds London offers us fans another fun way to interact and engage with the galaxy far, far away. It’s worth noting that you can’t just visit the Star Wars exhibit on its own, but as part of entry to the whole of Madame Tussauds. This is a very linear experience, with all visitors starting at the same place and following the same route through various themed zones and rooms, the ‘Spirit of London’ ride, and the Marvel Superheroes 4D Experience, with the Star Wars attraction right at the very end. This journey through Madame Tussauds can be quite an overwhelming audio visual experience, and if your Star Wars loving child is prone to overstimulation, then a visit here may not be right for them. But if this wretched hive of scum and villainy sounds like the place for you, head along and share your pics! Don’t forget to use the hashtag #StarWarsatMT, and tag/mention Madame Tussauds on Twitter, Instagram and Facebook. While it may not offer the bells and whistles of a theme park ride, Star Wars at Madame Tussauds is a more elegant attraction for a more civilized age. Disclosure: While I was not paid to write this piece, we did receive free entry to the attraction.